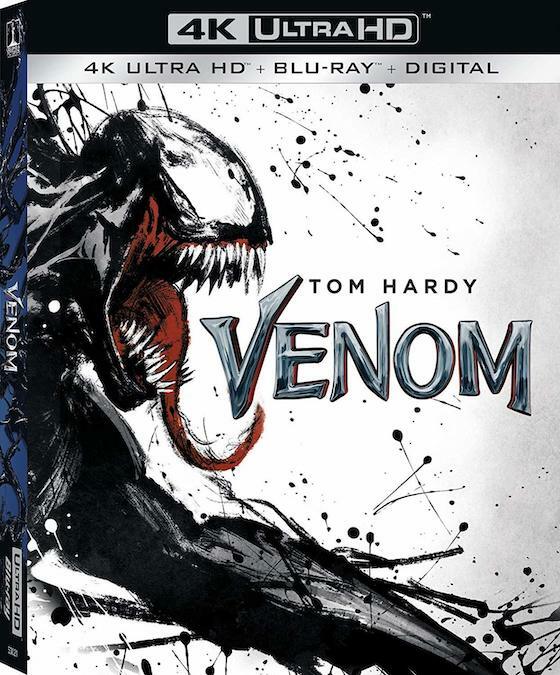 Sony Pictures Home Entertainment just gave us a release date as well as all the details of its upcoming 4K and blu-ray release of Ruben Fleischer's blockbuster superhero action film, Venom. And, naturally, it will hit retail shelves just in time for the Christmas holiday on December 18th. "When Eddie Brock acquires the powers of a symbiote, he will have to release his alter-ego "Venom" to save his life." 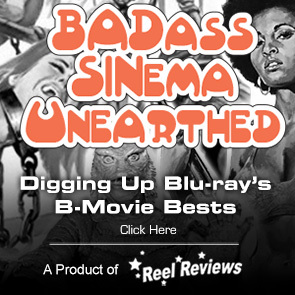 The studio says that in addition to a 4K Ultra HD + blu-ray + Digital HD package, a blu-ray + DVD + Digital package, there will be available a Best Buy Exclusive Steelbook release containing a 4K Ultra HD + Blu-ray + Digital Copy of the film. 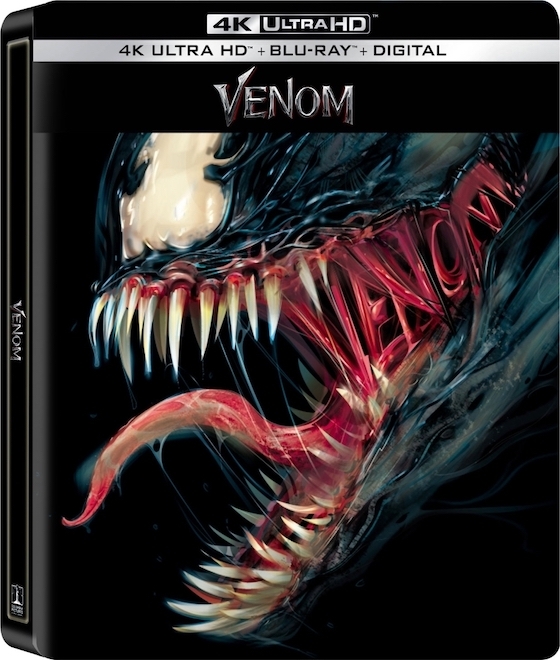 While we aren't super big fans of these exclusive retailer releases, this steelbok does look pretty damn cool with the symbiote's toothy grin taking front center of the steel case as crimson-colored blood, gums, and tissue spell out the word "venom" (see the cover below). And get a load of the special features and tech specs including a Dolby Vision HDR presentation and Dolby Atmos Audio Track. 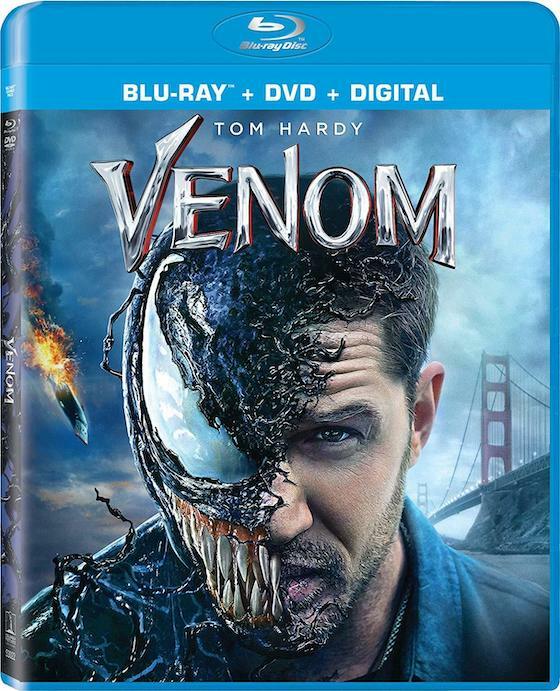 Venom in directed by Ruben Fleischer, stars Tom Hardy, Michelle Williams, and Riz Ahmed in a story about Eddie Brock (Tom Hardy) who becomes the host for the alien symbiote Venom. As a journalist, Eddie has been trying to take down the notorious founder of the Life Foundation, genius Carlton Drake (Riz Ahmed) – and that obsession ruined his career and his relationship with his girlfriend, Anne Weying (Michelle Williams). Upon investigating one of Drake’s experiments, the alien Venom merges with Eddie’s body, and he suddenly has incredible new superpowers, as well as the chance to do just about whatever he wants. Twisted, dark, unpredictable, and fueled by rage, Venom leaves Eddie wrestling to control dangerous abilities that he also finds empowering and intoxicating. As Eddie and Venom need each other to get what they’re looking for, they become more and more intertwined — where does Eddie end and Venom begin?